<p>Designing and building DNA sequences is a fundamental tool for anyone who works in synthetic biology. 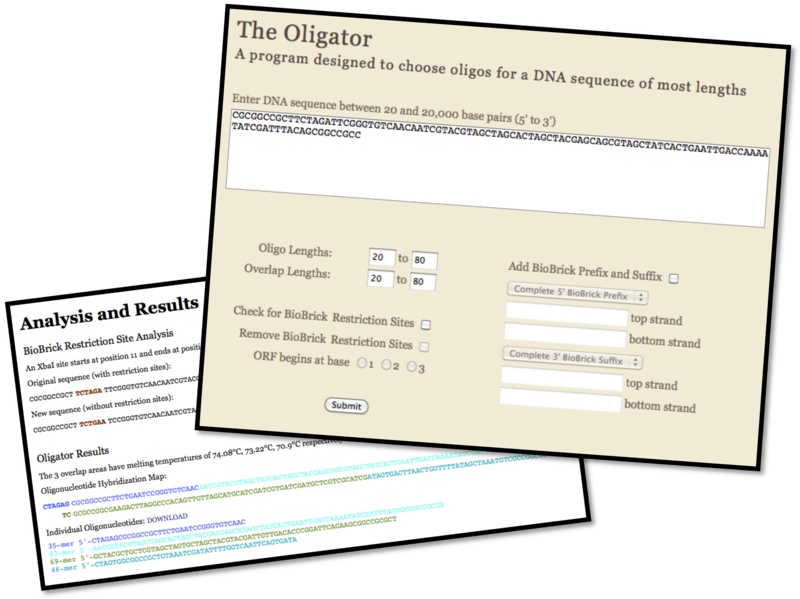 The Oligator is designed to choose oligos to create any desired sequence between 20 and 20,000 base pairs. The program allows the user to choose oligo lengths between 20 and 160 bp and overlap lengths of between 20 and 80 bp. The program will also check for and remove BioBrick restriction sites at the request of the user. Choosing the first checkbox will tell the user if BioBrick restriction sites exist anywhere in the entered DNA sequence and embolden where they occur. The second checkbox will remove the sites, leaving the amino acid sequence intact. Since keeping the amino acid sequence the same involves knowing the reading frame, a radio button must be filled in indicating where the reading frame begins. <p>The Optimoose is a tool designed to allow the user to evaluate the expression level of a sequence from ecoli using either RCBS-PC or the CAI formula. The user has then the option to either optimized or deoptimized the sequence by using one of those two formulas. If the optimize or deoptimize option is selected the user will be given a new sequence in which the codons have been changed to reflect the best, or worst, codons as determined by the selected formula. However, the amino acid sequence is preserved. <p>Designing and building DNA sequences is a fundamental tool for anyone who works in synthetic biology. The Oligator is designed to choose oligos to build any desired sequence between 20 and 20,000 base pairs. The program allows the user to choose oligo lengths between 20 and 160 bp and overlap lengths of between 20 and 80 bp. The program will optionally check for and remove BioBrick restriction sites. Choosing the first checkbox will tell the user if BioBrick restriction sites exist anywhere in the entered DNA sequence and highlight where they occur. The second checkbox will remove the sites, leaving the amino acid sequence intact, based on the user-input reading frame. Since keeping the amino acid sequence the same involves knowing the reading frame, a radio button must be filled in indicating where the reading frame begins. 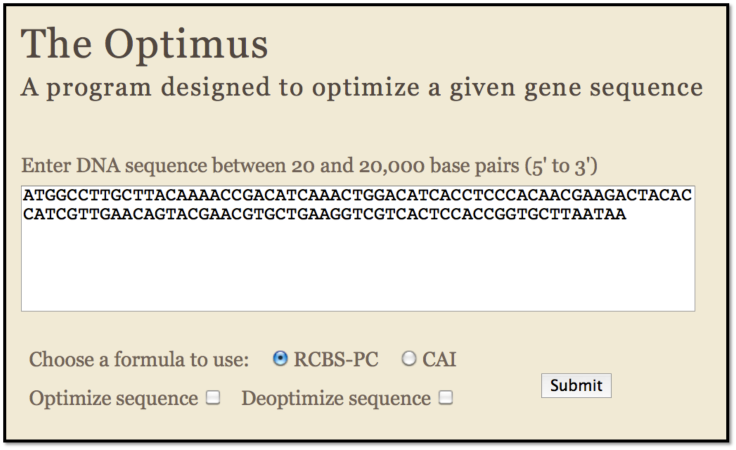 <p>Optimus is a tool designed to allow the user to evaluate the expression level of a gene sequence in <i>E. coli</i> using either RCBS-PC or the CAI formula. 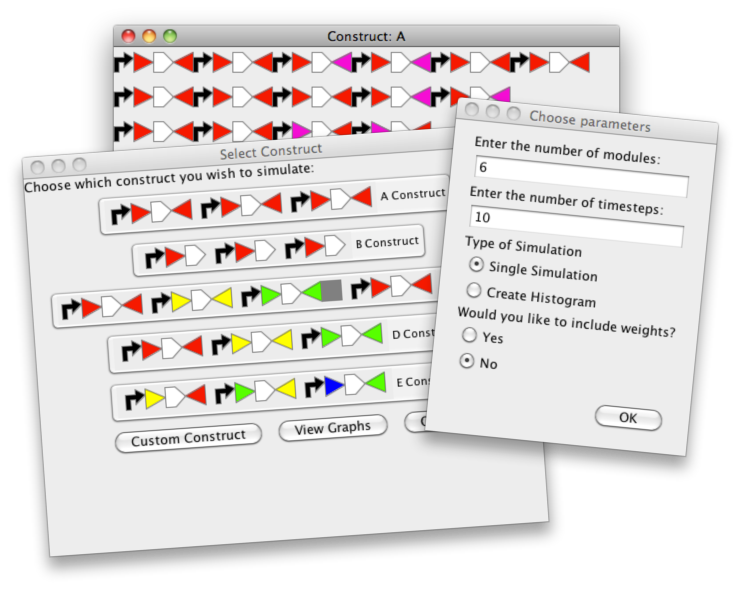 Additionally, the user has the option to optimize or deoptimize the sequence by using one of those two formulas. If the optimized or deoptimized option is selected, the user will be given a new sequence whose codons have been changed to reflect the best, or worst, codons as determined by the selected formula. Assuming the entered sequence is in frame, the amino acid sequence is preserved.